Post by Herrera’s Anneliese Sytsma. For the past year a team of engineers has been working with Engineers Without Borders (EWB) USA on the design of a coffee processing plant (beneficio) and associated wastewater treatment system for the Tierra Nueva Community (a community supported by our partner NGO, Agros). While in the design phase of the project, it was clear that we had certain unknowns that would be most effectively and accurately resolved with an assessment trip to the site. I and two other EWB engineers traveled to the Matagalpa area of Nicaragua to collect data to support the design, and to solidify relationships with parties involved. Tierra Nueva, from the top of Las Quadras Community. We stayed in La Dalia, a small town just outside of Tierra Nueva. After a long plane ride from Seattle, we (3 EWB members) were joined by 3 students from the University Centroamerica (UCA), one government surveyor, one Agros engineer, one governmental engineer, and a Tierra Nueva community council member. We squeezed into our 7-person rental truck (rule of thumb for Nicaragua vehicles: number of seats in vehicle + 3 = typical occupancy) and made our way to Tierra Nueva to meet with Tierra Nueva’s community members and introduce EWB’s mission as well as objectives and goals of the assessment trip. The bulk of the trip was spent coordinating between the Tierra Nueva community council, professional land surveyor, and builder, to discuss roles and responsibilities of each party. We discussed the basis of design for a typical beneficio water treatment system and gathered more than enough information to develop a site specific design based on the site’s peak harvest area, peak production rate, potential water supply, and maximum days of operation. 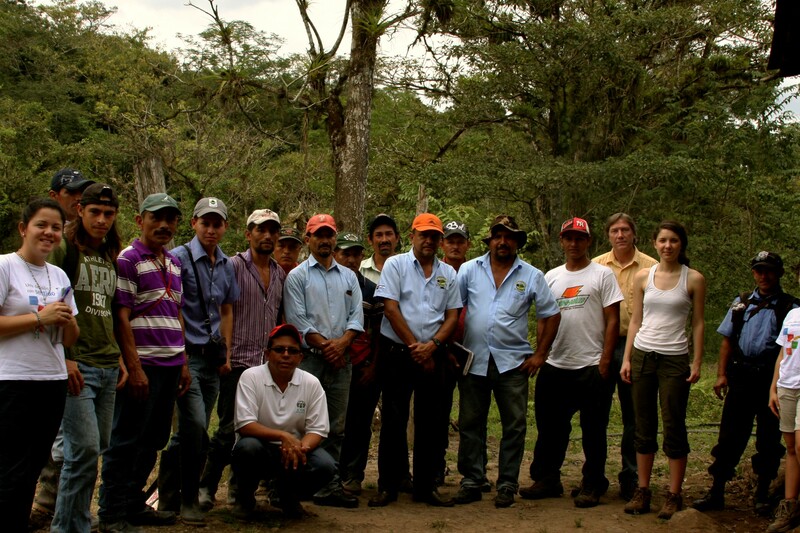 Conditions of the site were also a priority, and we spent a day evaluating the site layout and water source. We hiked (and sometimes scrambled) to the proposed location of the water intake structure along with the Tierra Nueva community members, their machetes, and the UCA students. In order to provide sufficient head to the site, the water intake structure needs to be approximately 1,200 meters upstream (and uphill) of the site. Here we took some preliminary flow measurements utilizing natural buoyant materials (e.g., leaves) to estimate the flow that may be delivered to the site. Tierra Nueva community council, EWB members, Agros Engineers, UCA students, local builders and police man attend the site assessment meeting. After a few days on site, we had established the connections we had set out to achieve. 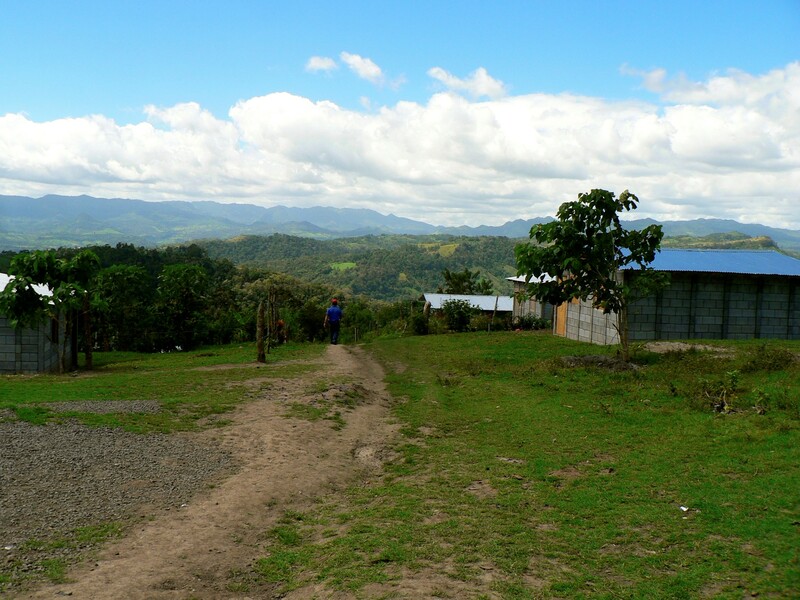 We left La Dalia and Tierra Nueva for the larger city of Matagalpa to collect cost information for some specific construction materials needed and visit coffee processing systems in nearby communities. Seeing the beneficios and water treatment systems in operation help us gain a better understanding of the type of construction materials used, maintenance issues and operating requirements of local coffee processing plants. The team is now back in Seattle and working hard to complete post- assessment trip reports and final design reports. Construction of the coffee beneficio and wastewater treatment system is planned to begin in June, with hopes of being fully operational in time for Tierra Nueva’s first harvest.